I am resuming blogging after a long time and I do this with a fairly inane post – our experiences with the Durian, Singapore’s famous fruit. 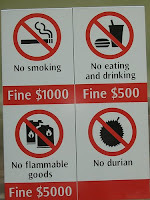 Having holidayed in Singapore last month we heard enough about the Durian fruit. Marvelled at the opera house built in the shape of the durian and laughed at the sign boards that prohibit people carrying the durian on the MRT trains. Back in Muscat at Lulu’s I saw a durian and bought it. That’s one of the perks about living in the Middle East - one gets exposed to so many foods and cultures. Back home, the husband and I googled to find out how one actually eats this fruit and then we set about doing just that. The durian reminded us so much of the jackfruit. Same thorny exterior, strong smell and pulpy fruit inside. However, the durian we bought was rather dry and tasteless. Compared to the jackfruit, the jackfruit was a winner all the way. And while we did not dislike the durian, it is not a fruit we will buy again in a hurry! i am conducting a study on blogs based in oman. can u pls mail me at samskrati@hotmail.com, so that i can fwd u the survey questionnaire.